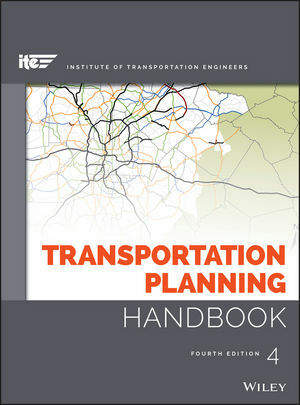 The Transportation Planning Handbook is a comprehensive, practice-oriented reference that presents the fundamental concepts of transportation planning alongside proven techniques. This new fourth edition is more strongly focused on serving the needs of all users, the role of safety in the planning process, and transportation planning in the context of societal concerns, including the development of more sustainable transportation solutions. The content structure has been redesigned with a new format that promotes a more functionally driven multimodal approach to planning, design, and implementation, including guidance toward the latest tools and technology. The material has been updated to reflect the latest changes to major transportation resources such as the HCM, MUTCD, HSM, and more, including the most current ADA accessibility regulations. Transportation planning has historically followed the rational planning model of defining objectives, identifying problems, generating and evaluating alternatives, and developing plans. Planners are increasingly expected to adopt a more multi-disciplinary approach, especially in light of the rising importance of sustainability and environmental concerns. This book presents the fundamentals of transportation planning in a multidisciplinary context, giving readers a practical reference for day-to-day answers. Developed by The Institute of Transportation Engineers, this book is the culmination of over seventy years of transportation planning solutions, fully updated to reflect the needs of a changing society. For a comprehensive guide with practical answers, The Transportation Planning Handbook is an essential reference. THE INSTITUTE OF TRANSPORTATION ENGINEERS (ITE) Founded in 1930, ITE is a community of nearly 13,000 transportation professionals including transportation engineers, transportation planners, consultants, educators, and researchers working in more than 90 countries. MICHAEL D. MEYER is a Senior Advisor for WSP/Parsons Brinckerhoff, Inc. For 30 years he was a professor of civil engineering at the Georgia Institute of Technology and the Massachusetts Institute of Technology. He has published over 200 papers/books on transportation planning and is considered a leading authority on transportation systems. Dr. Meyer has advised numerous countries, states and regions on transportation planning issues.